Marcelo Coronel was born in Buenos Aires, Argentina, in 1962. 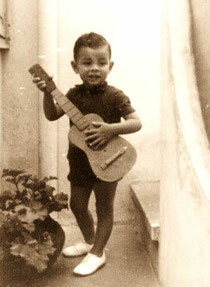 As a child he learned to sing simple Argentine folksongs while playing along with a guitar. The styles of urban music later exposed Marcelo to a world of new sounds. He eventually entered the School of Music at the National University of Rosario, where he formalized his musical education before graduating with an advanced degree in Music - Emphasis on Guitar. Paralleling his university course work, Marcelo studied harmony and counterpoint with the composer Dante Grela. As a performer Marcelo has participated in a number of popular and chamber music ensembles. Notable among these are 'Escarbanda' (a trio of piano, guitar and percussion), 'Los Khorus' (a quartet of guitar, charango, quena and siku*), ‘El Entrevero’ (a guitar duo with Leonardo Bravo) and ‘Golondrinas invernales’ (a guitar quartet). Marcelo formed ‘Meridiano’ (a flute and guitar duo with Maria Amalia Maritano) in 1992, and most recently, ‘Tallar el aire’ (a guitar trio that plays normal guitar, baritone and alto). Marcelo is also frequently invited by other artists to participate in concerts and recording sessions. Marcelo began to compose music in 1985, and has composed for solo guitar, guitar duo, guitar trio, guitar quartet and flute and guitar. His main creative pursuit lies in the preservation and evolution of the folk music tradition. This can be understood as applying non-traditional musical language to the traditional rhythm, harmony and melody of folk forms. Marcelo Coronel lives in Rosario (province of Santa Fe), where he divides his time between composing, performing and teaching. He specialises in teaching Latin-American folk guitar, classical guitar, theory, and aural awareness at his music studio in Rosario. * Charango: A small string instrument, with a soundbox made from an armadillo's shell. / Quena: Bamboo flute. /Siku: Andean pan flute.